I was raised in Mangum, Oklahoma where I graduated from high school in 1984. I attended Southwestern Oklahoma State University, majoring in criminal justice with a minor in political science. I went to work for Elk City, Oklahoma police department in 1989. I continued my law enforcement career until 2008, working for Lexington and Purcell police departments. I’m currently employed at SandRidge Energy in Oklahoma City as a technical security analyst. I moved to Lexington in 1997 and have lived here for more than 17 years. I love the small town atmosphere and plan on spending the rest of my life here. I have been married to Tonya High-Adams since 1998. Tonya currently serves on the Lexington school board. We both believe in continuing to improve and support our community and schools. Tonya and I are blessed to have six wonderful children, five of whom are grown and living interesting lives of their own. We are also blessed with seven beautiful granddaughters. I hope that during my time as a council member, I will be able to continue serving the citizens of our fine community in a manner that is both productive and fair. We face many difficult decisions as a council, but I know that as a community, we can continue to make our town a place that we can all be proud of. Max Punneo has lived in Lexington for the past 45 years, graduating from Lexington High School in 1989. He is married to Reika and has 4 children. He has served as the K-9 officer for the City of Lexington and now works for Wadley’s Ambulance Service and has for the past 21 years. Max has been a volunteer firefighter since 1993 and currently serves both Lexington and Purcell Fire Departments. Max is new to the City Council and looks forward to serving the citizens of Lexington. We bought our house in Lexington 25 years ago and I’ve enjoyed living here very much.. Even though I grew up near Slaughterville and graduated from Noble High School in 1979, I have been a member of the First Baptist Church of Lexington since 1975. My wife Margo graduated from Lexington. We have been married for 32 years. Margo works at Norman Regional Hospital. We have two sons, Justin and Trenton. Justin and his wife Micaela live in Edmond with their daughters Bennett Raye who is 4 years old and Reagan Lee who is 2 years old. Justin works at Data Ray and Micaela is a music teacher. Trenton and his wife Haley live in Perkins. Trenton is a Driver and EMT for the Stillwater Fire Department and part-time Police Officer for Perkins. Haley is a Registered Nurse at the Stillwater ER and the Norman Healthplex. I have been employed with the Norman Fire Department for 34 years. I am a Captain at Station #8. I have served on the Lexington City Council since March of 2005. I received training in March of 2006 on “Principals of Municipal Government” at the Oklahoma Municipal League (OML). I also serve on the Lexington Fire Department as a Captain/ Training Officer. I enjoy working with our City Council and with our Volunteer Firefighters. These men that serve on the Lexington Fire Department are some of the finest men that I have been associated with in the fire service. These men sacrifice a lot and are truly dedicated to helping the people of Lexington. I am very proud to be a member of this department. I believe the City of Lexington is a great place’to live. It is a quiet town with good people. I plan to stay in Lexington so I want to be involved in the future of the City. 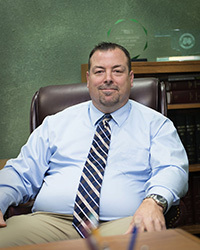 Chris Coker grew up in Lexington and graduated from Lexington High School. After 3 years of service in the U.S. Army, he and his wife, Deborah moved back to Lexington. Chris and Deborah raised both of their children, Jordyn & Zac, in Lexington. 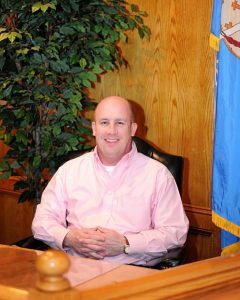 Chris’s career in law enforcement began when he worked for the City of Purcell Police Department for 23 years. While at the Purcell Police Department, Chris rose to the rank of Assistant Chief of Police. 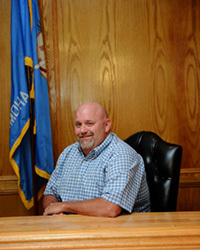 In 2010, Chris served as the Interim City Manager for the City of Purcell. Born and raised in Oklahoma City, Ricki Lea Moore graduated from Putnam City West High School in 1997. She married her high school sweetheart, Doug Moore in May 1999. Ricki Lea graduated from Oklahoma Baptist University in 2001 with a degree in Elementary Education. In 2001 the Lord called Doug to serve at First Baptist Church Lexington as the Youth Minister and the two have made this community their home. Ricki Lea taught elementary music for one year at Lexington Public Schools. She has been the part time children’s coordinator at FBC Lexington since June 2011. Her true passion is being a mother and a youth minister’s wife. Doug and Ricki Lea are expecting their 5th child in November 2015. Fred Jones grew up in Augusta, GA. 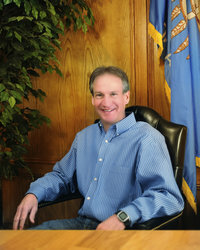 He moved to Norman in 1979 where he attended the University of Oklahoma. Since then, Fred has made Oklahoma his home. In December, 2013, Fred and his wife, Diane, bought a home in Lexington and plan to retire here. Fred made his career in the restaurant and food service industry managing and opening restaurants in several states but always returning to Oklahoma. Diane is an emergency room nurse, currently working at Purcell Municipal Hospital. Together, Fred and Diane, have a total of 5 children and 4 grandchildren. Besides spending time with his family, Fred enjoys cooking, traveling, and especially Oklahoma football.